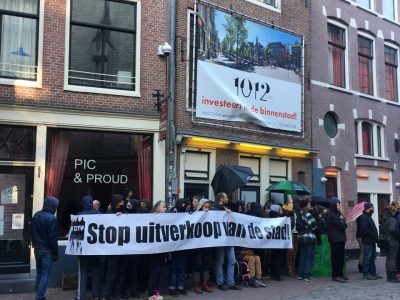 Amsterdam, Netherlands: ADM Sympathizers squatted out of protest a premises in the city center. On Sunday 28 October, a number of ADM sympathizers squatted a building in the Red-light district; Oudekerksplein 30. After hearing alderman Kock’s proposal to move the ADM to Almere in two years, many were stunned. One could not believe that the alderman had so little understanding of the social added value that Free-spaces & Fringes have for the city of Amsterdam. Recently, even in the media it was pointed out that the city loses its soul now that the fringes of Amsterdam are in Zaandam. Does Kock really want to move the fringes of Amsterdam to Almere? To counter the doom scenario of a soulless city, we have squatted a building in the Red-light district, where a new temporary cultural center will be erected. In this way we want to add liveliness, creativity and especially inspiration to the city. A much needed counterweight to the gentrification that is hitting with full force. On the two upper floors people will be living. With this we also make a statement against the housing shortage which now reaches yet another peak, especially regarding social housing. Waiting times of fifteen years are no exception in the city of Amsterdam. The ground floor will serve as a meeting place for people from the neighborhood, for example a vegan eatery, small-scale cultural- and social activities. This space will also serve as the ADM Action Center. Finally, we want to give a counter-sound to the yuppie culture that also has a big impact on our Red-light district. Next post: #Yogyakarta #Indonesia: Fundraising for #Aftonomi Infoshop!